Here’s a new video to keep you busy till the game’s release next week: It’s entirely gameplay footage from world 3 (Jungle). Enjoy. You can download a high-quality 60 frames/sec version of the video from the official Jett Rocket web site. Also grab the iPhone-compatible video from there. Welcome to “Making of Jett Rocket”, part three. In this part we will shed some light (and shadow) on the creation of the actual environments, where all the action is happening. Our vision for the game was to make something colorful, beautiful and shiny. We wanted vast landscapes and open views. Although the game takes place on another planet we wanted the environment to also remind the player of interesting spots on planet earth. How could we wrap that all up? The solution was to use islands and plateaus as main playing locations. Those are of finite area and so you don’t get lost easily. Still they give the impression of a large location. We then created some first concept artworks to find the right mood, colors and forms for the stages. The concepts are important to have a clear idea when later going into the 3D modeling stage. Modeling and texturing does take a lot of time and none of that should be wasted. As soon as we decided on the core elements in the 2d concepts we started designing the actual 3d elements in Maya (a 3D application). For all our Wii games we use a proprietary pixelshader plugin that emulates our Wii tech. So we have true WYSIWYG while designing each element. That saves valuable time. In our proprietary Game editor we place all of the geometry, bake ambient occlusion, setup lighting conditions and so on. For the finishing touch we can export each location to a Wii devkit within a few seconds. All unchanged assets are cached on the Wii to minimize loading times. On the actual Wii devkit we finally adjust every nuance to look good. We also take care that the super crisp high resolution artwork still looks nice on a TV screen. Actually we need to use a couple of tricks on the Wii to have everything look crisp and detailed without having too much aliasing artifacts. We were pretty happy with our first location though it still looked a bit ‘last gen’. An important effect was missing: Proper lighting. For our type of game the lighting does not need to be physically accurate, but it has to make the setting more believable, add more depth and set the desired mood. To give the right impression of depth we added some atmospheric lighting. This depends a lot on the actual day time and weather. On top of that we add some dynamic global lighting. This emulates the bouncing of light rays in a scene. Actually it glues everything nicely together and enhances the overall look a lot. As important as proper lighting are shadows and ambient occlusion in a scene. They give you hints about the position of an object in the world. They also make everything more solid. We used a mix of dynamic and static techniques. The static shadows and ambient occlusion are very soft. The dynamic shadows are a bit harder but still have a soft penumbra to match the static ones. For the player we take care that his shadow is always exactly below him. Although this does not match the actual light position it makes it much easier to see where you will land when you jump or fall down. We love adding weather effects to our games. From thunder to rain to snow. It simply adds atmosphere and gives a great feedback. Actually almost every level in Jett Rocket has another weather condition. As the player warps from one location to another it also emphasizes the idea that you just have traveled hundreds of miles in just a second. Here’s a new video to keep you busy till our next “making-of” post: It’s entirely gameplay footage from world 2 (Northpole). Enjoy. Don’t forget to check back next week for the next part in our “making-of” series. Welcome to “Making of Jett Rocket”, part two. This time we will go into detail about some of the actual game design decisions. We will pick out a few sections that define the heart and soul of “Jett Rocket”. When we decided to do a 3D jump’n’run we had to choose what overall experience we wanted to deliver. When we play games ourself we enjoy to explore large worlds, though on the other side it’s a bad thing when you feel lost and have no clue where to go first. So we decided to break down the areas into smaller, self contained levels with a clear goal and a number of sub goals. The gameplay itself should focus on exploration, puzzle solving and collecting stuff that allows you to progress into more advanced areas. And all that glued together with some intense action gameplay. The levels should feel non-linear with different paths to explore and only with minimum camera scripting. That meant we needed an intelligent camera system that tries to detect what the player wants to do and where we wants to go next. The player should be able to adjust the camera but he shouldn’t be forced to. Although this is a classic problem in game development it is still very hard to solve. And only few games did a good job at that topic. Fortunately, after a lot work, we were quite happy how our camera system turned out. 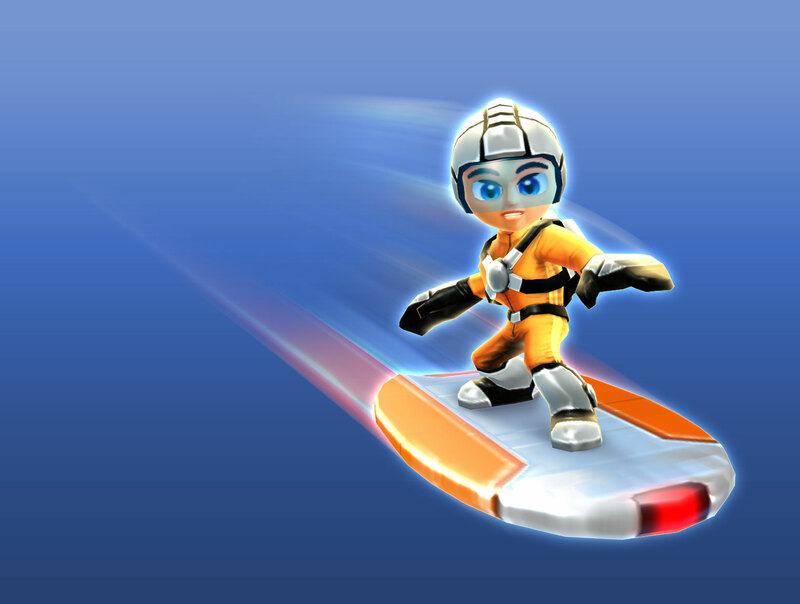 After setting up the general gameplay constants we concentrated on “Jett Rocket” himself. We wanted him to do the standard variety of jump’n’run moves but he should also have something special. Quickly we had the idea to give him a jet pack. After some testing we knew that it was a good idea. This immediately gave the game a character of its own and dramatically changed how levels needed to be directed. With the jet pack you can go to many places you wouldn’t be able to get otherwise. By spreading ‘fuel’ stations across the levels we were able to give hints to the player without really telling him too much. 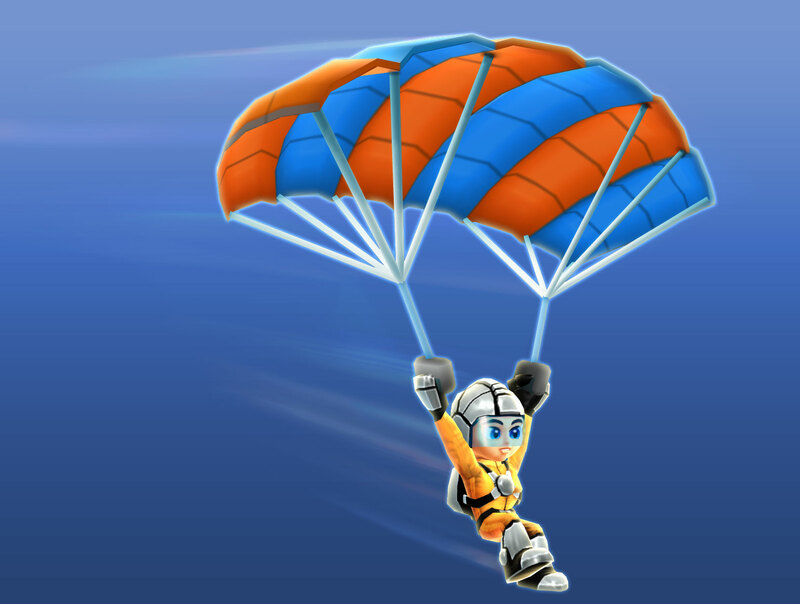 We also added some motion controls to refill the jetpack which turned out to be great fun. Those controls were perfectly intuitive without having the feeling to waggle for nothing. 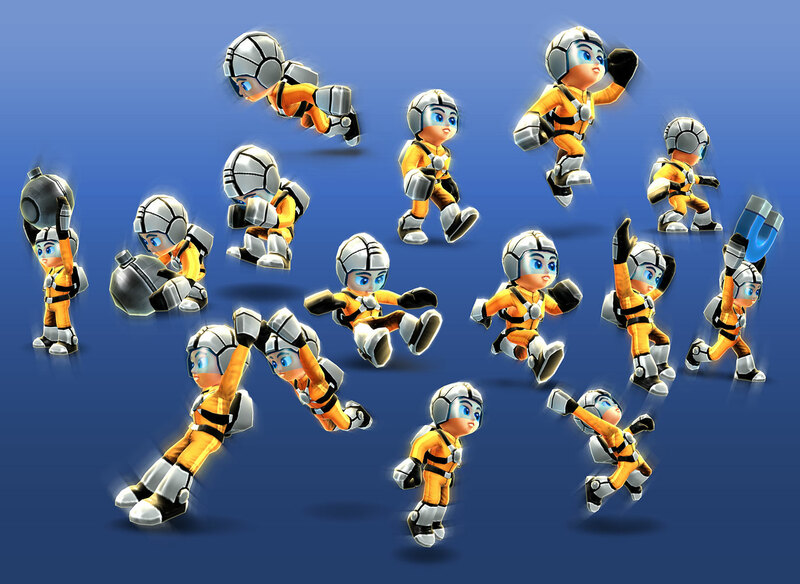 All in all “Jett Rocket” can perform around 20 different moves and attacks. A third of the moves were already available when we started with the first level. The rest came in when we had a great idea or when something new was needed to keep the player interested. 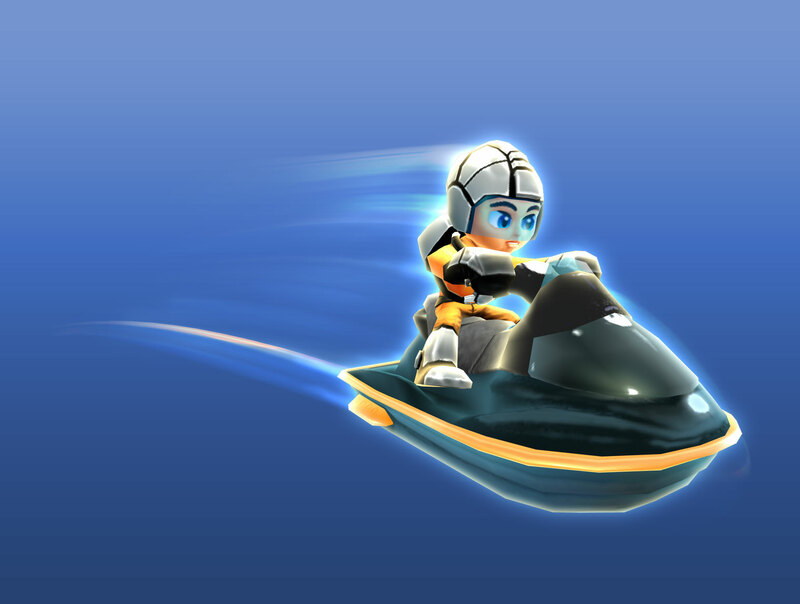 Especially adding vehicles to the game was pretty fun for us and gave the players something new to experiment with. The vehicles are not just decoration, you really need them to solve the levels. Many nice games on the Wii are running in 30 frames per second (fps). Often people don’t even immediately notice a difference to 60 fps games. Developing for 30 fps is easier as a developer has twice the power available for each frame. So it’s tempting to drop 60 fps support. At Shin’en we love the super fluent look of a 60 fps title. Also controls are tighter on 60 fps than on 30 fps. Some may now argue that 30fps means you could have better graphics. Well, we remember that we could draw around 2000 triangles per frame on the Nintendo DS. Although that was a limit it wasn’t a problem to make games like “Nanostray 2” look absolutely gorgeous. On the Wii we can easily show 50 times as much polygons , plus we have stunning shaders. So if we couldn’t deliver nice graphics with that many polygons and all that shader magic then we would do something wrong. After all the best rated Wii titles use 60 fps (Metroid Prime series, Wii Sports Resort, Super Mario Galaxy, Mario Kart, etc). Although may not be immediately noticed, we believe that 60 fps deliver a better overall performance for a game. 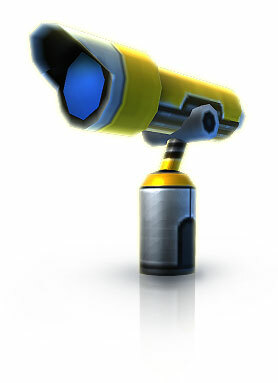 That was reason enough for us to take the extra challenge and develop “Jett Rocket” in rock solid 60 fps. We hope you enjoyed the picks from our daily development grind. Next time we will talk about the “Jett Rocket” universe, the actual level design and how tiny lighting makes a big difference. Stay tuned! Here’s a new video to keep you busy till our next “making-of” post: It’s entirely gameplay footage from world 1 (atoll). Enjoy. Hi guys! Due to public demand we would like to give you some exclusive insight in the making of Jett Rocket. We will present three ‘making of’ parts, each one going into detail on some specific categories of the development of Jett Rocket. When developing for WiiWare you can take full advantage of all the power the Wii has to offer. The only limit is your game has to fit into 40Mb. In comparison, a disc game like Zelda Twilight Princess or Mario Galaxy, has more than 1GB of space available. This means all your games code and assets can only utilize ~4% of the space retail games can use. 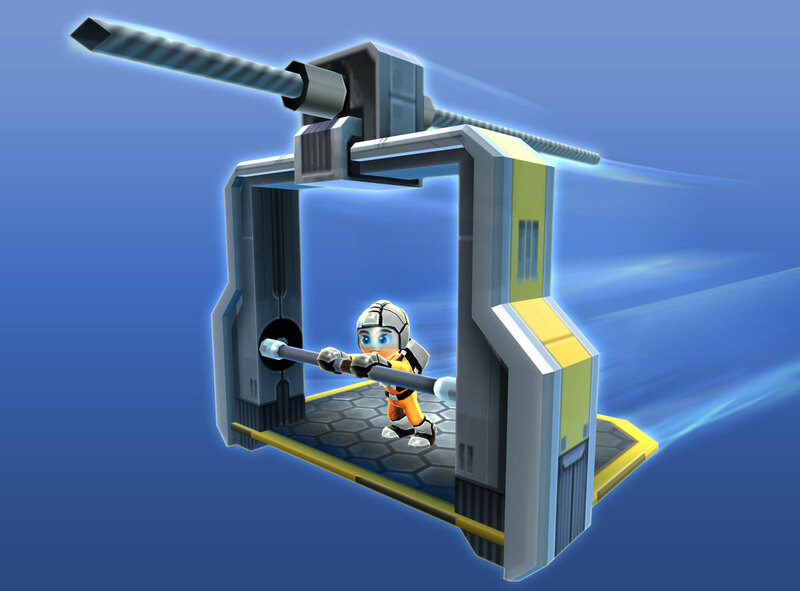 At Shin’en we took the challenge and decided to develop a full-featured 3d jump’n’run game for WiiWare. That was something we really desired to do for years. We wanted that game to have many large levels the player can explore. We aimed for very varied and fun gameplay and the best possible graphics on the system. Coming from Nintendo DS development we knew how to put a lot of game into a little space and we were pretty sure we would succeed if we just try hard enough. That was almost two years ago. As soon we worked out the storyline our art department started with character creation. We wanted a very agile look for the main character ‘Jett Rocket’. As the storyline is based on sci-fi motives the character should also look quite futuristic. And of course it should all look great from far away and in close-ups. Our budget for the main character was around 400kb. Most other objects had a budget of around 50-100kb. In the final game we had over 200 moving props and animated characters. The Wii is quite fast in combining many textures in realtime. We use that ability to create our shaders (or materials) from many ‘layers’ on top of each other like in a graphics application. As some layers only have low frequency information we use much lower resolution textures to save some space here. How those layers are combined can be adjusted in many ways, even in real-time to some degree. Some textures for the layers are also created in real-time. We use that feature of our engine quite a lot to achieve special effects like reflections, refractions and various lighting effects. Usually we start with a paper and pencil artwork for each character. Then we create the basic mesh, the color texture and finally add lighting and specular components. Chopercha enjoy flying around with the rotor on their backs. They get all excited when anyone draws near. The reckless Snapo only feel strong in groups. Be sure to check back for the next post. There you will learn more about actual gameplay, Jett’s special moves, the vehicles he can drive and much more. Stay tuned!